Hong Kong is most certainly not in short supply when it comes to places for eating out. There's restaurants, cafes and food stalls simply everywhere. Of course there's no way I've been able to try everywhere, so this is not a comprehensive list, but over the past few months I have had some pretty good dining experiences. Hong Kong is such an international city that naturally it has many, many choices of cuisine available, so whatever you feel like, you can probably find it somewhere! So this is a list of my favourite places for eating out, so far, and all within a reasonable budget range, and in no particular order. I never take food photos actually! Image source. 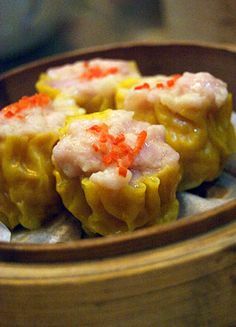 You can't really visit Hong Kong without trying dim sum, and this is my recommendation of where to get it. A friend showed it to me, and I've been about half a dozen times already. It's a small place, down one of Mong Kok's numerous streets, not too far from Ladies Market, and is frequented by locals and foreigners alike. There's a big range to choose from - dumplings, pork buns, rice rolls, spring rolls, and so much more - although be prepared to communicate in broken English and pointing. I'm not fan of the coriander-heavy dishes, but there's plenty else that I enjoy here. This place is a little more upmarket than the places I normally go to, but it's worth every penny to go as a treat from time to time. Their speciality is burgers, and there's so many choices available - we took a very long time to decide on our visit! There's vegetarian options too, and a lower calorie bun-less burger option, as well as non-burger dishes and side orders (I'd definitely recommend the sweet potato fries). My meal was so delicious that I inhaled it in about ten minutes! I didn't have room for dessert, but they sure looked good... next time! I love Mexican food, and this is one of the best places I've found for it here. It's a very relaxed atmosphere here, and almost feels more like a bar than a restaurant - channelling a Mexican cantina vibe. Although not much can top the Mexican food I had in Central America, this place has everything you'd want; burritos, nachos, tacos, tortilla soup (one of my favourites), and of course, lots of flavours of frozen margaritas to wash it down (with happy hour deals). We ended up ordering dish after dish! They also do Taco Tuesdays, which is $10 per taco, so how can you refuse? Sometimes you just want pizza, ok? This is a chain of New York style pizzerias, with locations all over Hong Kong. I dare you not to start drooling when you walk in and see the display counter full of massive, massive pizzas. You can order by the slice, or get a whole one, in varying sizes, and either order one of their flavours, or choose your own toppings. Honestly, the slices are so huge that one is more than enough for me! There's also pasta, salad, calzone, sub sandwiches, and various side orders available - this is also where I come to satisfy my cravings for onion rings. I couldn't write this list without including Mr Wong's, which was actually where I had my first ever meal in Hong Kong, on the night I arrived. It's a little hole-in-the-wall place, with tables and chairs spilling on to the street out back. The owner, Mr Wong himself, is such a funny, colourful character, which really makes the atmosphere of the place. Plenty of locals eat here, but it's most popular with expats at the weekends, due to the fact that you pay just $60 for as much food and drink (beer, and sometimes he has wine) as you want. You don't really order specific dishes, but instead will just be given a bunch of different Chinese courses to share along the table. It's an experience I think everyone should try! Honourable mention: Cali-Mex is another chain of restaurants throughout the city, serving more Mexican dishes - yes, it's one of my favourite cuisines! I didn't want to include 2 Mexicans on here, but this is a cheaper, easy takeaway option, compared to Tequila Jack's. Price range: $100 per meal.